Making Better Bread Choices: Enriched Flour is Nutrient Poor Good News About Chocolate! In a previous article, we looked at how to make healthier bread choices. I discussed how refined flour is stripped of its nutrients and then “enriched” with lab-created versions of the nutrients. I also shared how flour can spike blood sugar levels and suggested some healthier bread choices. In this newsletter, I’m going to look at traditional starch options like pasta, rice and potatoes to see why pasta comes out as the best choice. I want to talk briefly about why the Glycemic Index is a helpful guide (but not an absolute rule) and look at how it applies to bread to provide context when we look at how pasta, potatoes and rice measure up. As I discussed in the bread section, certain foods spike blood sugar levels. The Glycemic Index is the scientific system that measures and monitors those increases across all carbohydrates. The lower the number, generally speaking, the better because that means the food will be digested more slowly, will result in less insulin spiking and will provide more protection from diabetes, high blood pressure, high triglycerides, heart disease and obesity. In addition to helping you to avoid certain health conditions, lower Glycemic Index (GI) foods also aid in weight control. A study of overweight teenagers eating a low GI breakfast showed that they ate 45% fewer calories throughout the day than when they began their day with a high GI breakfast. Foods that stimulate insulin have been shown to increase calorie consumption at the next meal and research shows that if calorie intake is equal, eating lower GI food will result in weight loss. But there are a number of problems with relying completely on the index as a food guide. First, GI food measurements are imprecise. Generally speaking, the test is done several times and the results are an average of those outcomes. For example, a baked russet potato has been shown to have a GI value as low as 56 and as high as 111. As a result, it is listed in the high 70s on most indexes. The GI index for fruit increases as it ripens and changes depending on the food processing method and time. Grinding or cooking will increase the GI as will cooking for longer periods of time. The GI of any one food is also altered significantly based on what it is combined with. I recommend eating healthy fat, protein and fiber with every meal because it reduces insulin spiking and decreases the likelihood that higher sugar foods will be stored as fat. But how much you eat matters too: Some foods have a high GI but you likely wouldn’t eat a lot of them, so their overall “load” is lower, while others may be lower, but you are more likely to consume a good portion. And lastly, individual responses to carbohydrate digestion vary, as do insulin responses, and those responses have been shown to vary based on the time of day the food is consumed. As a result, the Glycemic Index can be a helpful tool but should not be relied upon in absolute. It is helpful for making relative comparisons and trade-offs. Something that falls in the 80s is a less healthy food choice than something that lands in the 40s. Generally speaking, it’s a good idea to minimize consumption of foods with scores over 55 on the GI. But some of those foods have great nutritional benefits, so that doesn’t mean you should never eat them. Instead, consume them in moderate portions, on occasion, combined with fiber, healthy fats and protein. It’s easy to see why a processed bakery product might need to be eliminated, but a potato or watermelon can be eaten in moderation. Now let’s talk about how the Glycemic Index applies to pasta and rice compared to bread. In addition to being nutrient devoid, traditional white bread and most whole wheat bread (made from enriched white flour) is high on the Glycemic Index. Typical white or wheat bread and bagels fall in the 70s, while pita bread lands in the high 50s. I love a good French bread as much as the next person, but baguettes fall in the mid-90s! It seems logical that pastas would go much the same way as breads, with traditional white and wheat pastas being significantly higher glycemically than whole grain and sprouted grain versions. But that is not the case. Even though some potatoes and brown rice have levels in the mid-50s on the GI, which makes them viable options on occasion, pastas have an even lower GI. During processing, ungelatinized starch granules get trapped in the sponge-like gluten (protein) network inside the pasta dough. This does not occur in the processing of bread or rice and as a result, pastas tend to have a lower Glycemic Index overall. Traditional spaghetti comes in at 41 on the GI scale, with its whole-wheat version at 37, making these clear winners, with a few caveats. There is one surprising exception: brown rice pasta. Brown rice pasta comes in at a whopping 92 on the Glycemic Index: A surprise to me since brown rice itself is not high on the GI and whole grain brown rice is a nutrient-rich food. I’m still researching what it is about the transformation from rice to pasta that makes brown rice so high on GI scale. 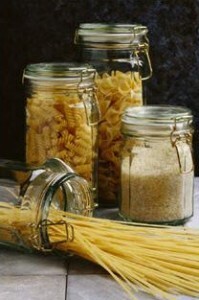 But until I learn more, avoid brown rice pasta and stick to traditional pastas. When you do eat pasta, combine it with healthy fats, proteins and carbohydrates to create a balanced meal; here’s where fresh homemade vegetable sauces made with healthy fats can take your meal to a whole new health level. And here’s a tip if you are concerned about blood sugar: add some acid like vinegar or lemon to help lower the GI of the meal. While you do get some additional nutrient value from a whole grain, multi-grain or sprouted grain pasta, the glycemic difference of whole wheat is not significant versus traditional pastas. Some of the newer whole grain and sprouted grain versions have not even been tested yet and while their scores may be lower, the baseline for traditional pasta is pretty good to begin with. While I encourage you to experiment and try some of these nutrient-rich grain products — variety in food choices is always a good thing — if the taste does not appeal to you, it’s OK to indulge in some traditional pasta on occasion. Mangia!